ISLAMABAD: Brig (retd) Imtiaz Ahmed is an American agent planted by the American agencies mainly to defame the Pakistani intelligence agencies, former director Federal Investigation Agency (FIA) Malik Mumtaz Ahmad said on Thursday. While addressing a press conference, he said after having played a key role in toppling the Benazir government in 1990, Brig Imtiaz was now bent on destabilising the present government. Malik Mumtaz claimed that he had informed the then prime minister Benazir Bhutto through her special secretary (security) of the conspiracy plan ‘Midnight Jackal’ of Brig (retd) Imtiaz and Maj (retd) Amar. She contacted the then Army chief Gen Aslam Baig but he had denied. Malik Mumtaz claimed that Benazir had sent her interior minister Nasirullah Khan Babar to Aslam Baig but the Army chief had again denied the report, asking him to produce evidence about the conspiracy. “He is playing in the hands of American agencies to destabilise the political system,” Malik Mumtaz averred. “He is opposing Mian Nawaz Sharif to get entrance in the PPP camp,” he added. He appealed to the Supreme Court to take suo moto notice against Brig Imtiaz and reopen his corruption cases. He claimed Brig Imtiaz’s “anti-state activities” were creating confusion in the political system. The former FIA chief alleged Brig Imtiaz had collected illegal wealth during his tenure as IB head. 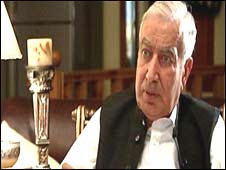 Malik said that a corruption case was lodged with the FIA after the brigadierís removal during the Benazir government. However, the FIA did not pursue the case in the court, and, consequently, it was dismissed. Malik said Brig Imtiaz made 27 valuable properties and a heavy account in a bank of London, adding, he got himself freed from the cases by using his influence during the Nawaz government in 1997. The second case of corruption against Brig Imtiaz was registered by the Account Appellate Bureau chairman in 2000, Malik said, adding that the detailed list of his properties was attached with the petition. The properties included three houses and three commercial units in Islamabad as well as foreign exchange bearing certificates to the tune of Rs 20.8 million. He said a court sentenced Brig Imtiaz to eight years rigorous imprisonment with a fine of Rs 7 million, also confiscating his assets. The court disqualified him for ten years for holding any public office or statutory or local authority. But he, taking advantage of the NRO, managed to retake his property. Malik disclosed that before his “retirement at fault” from the Army in 1988, Brig Imtiaz had declared his total asset as a two-kanal plot at the Lahore Cantt Officers Society (Phase-II) and a 2,000-square-yard plot in the Defence Housing Society, Karachi. He questioned how Imtiaz made property worth billions of rupees as IB chief. Imran Khan hailed PCOed Judiciary!